Just because it’s no longer news, don’t think the Royal National Park fires are over. For walkers, the impact will be felt for months to come. Below is exactly which walking tracks remain open, and which are closed (read on or skip straight to track closures). The 2018 fires – thought to be deliberately lit on 20 January – have burned more than 2000 hectares; nearly 15% of the park. Thousands of people were evacuated from within the park, and those remaining were urged to stay close to beaches and water. Thick grey smoke could be seen over much of southern Sydney and the Illawarra. It took six days for the Rural Fire Service (RFS) to get the Royal National Park fires under control as they threatened to rekindle under hot, windy conditions. This is a huge effort by volunteer firefighters, and it's their efforts, combined with agencies like local surf lifesaving clubs, police and NPWS that protected lives and environment. Big, big thanks (and a nod to locals in the cabin communities – “shackies” – who extended hospitality to those stranded in the park). While the fires are now contained, the RFS maintains a patrol status as smouldering continues for weeks afterward. Crews take a breather after a hard night's work on the fire in the Royal National Park. #nswrfs #royalnationalpark #sydney Pic: Sutherland RFS. National Parks and Wildlife Service took immediate action, at first closing Royal National Park entirely, then reopening with some track closures. These closures are likely to continue well into 2018, firstly with immediate fire danger then track repairs. Looking at the helpful Fires Near Me app or website (screenshot above taken 30 January 2018), the site appears as the ‘Sir Bertram Stevens Drive fire’. What Tracks are Open or Closed? While you can see (and please do check) the latest alerts put out by the National Parks and Wildlife Service, here's where you can walk after the Royal National Park fires, and where you can’t. The Coast Track is OPEN (including between Wattamolla and Garie). Between January and 31 March 2018, the middle section of the Coast Track between Wattamolla and Garie was closed, leaving only the northern and southern sections accessible. While there will be continuing track work required, walkers can once again walk the entire Coast Track, without restriction. 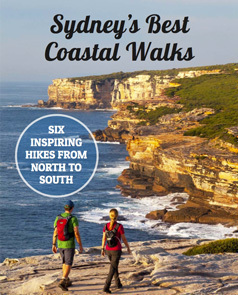 While the Coast Track is the jewel in Royal National Park's crown, there are other walks to try away from the coast. Ian‘s recommendation (he's spent more hours on tracks than me) is to do the loop between Heathcote and Waterfall, camping overnight at Kingfisher Pool. Or create your own 20km bush walk by starting at Waterfall, walk via Uloola Falls Track to Audley. Then continue on to Winifred Falls, then Maianbar to finish at Bundeena. You could stretch this to a two day walk but both Royal National Park campsites (Uloola and Bonnie Vale) are close to either the start or end. It's the closure of this track that's a particular reminder of how devastating bushfire can be to fauna and flora. Curra Moors is always bursting with plants and animals in Royal National Park, and my hope is for green shoots and new homes for them all. This is another great area for plants and animals so fingers crossed the animals recover too. The plants will thrive and this track is a highlight for the wildflower season this winter. This track is a hidden gem. It runs east off Lady Carrington Drive to a sandstone cave that has a massive limestone pillar ‘supporting' it. Numerous other stalagmites and stalactites dot the cave and it's beside a beautiful small cascade section of Palona Brook. Check it out when it opens after the Royal National Park fires; it's beautiful. This information is correct at time of editing, 13 March 2018. Remember to check NPWS alerts for up-to-date track closures. Tagged Jibbon, Royal Coast Track, Royal National Park.